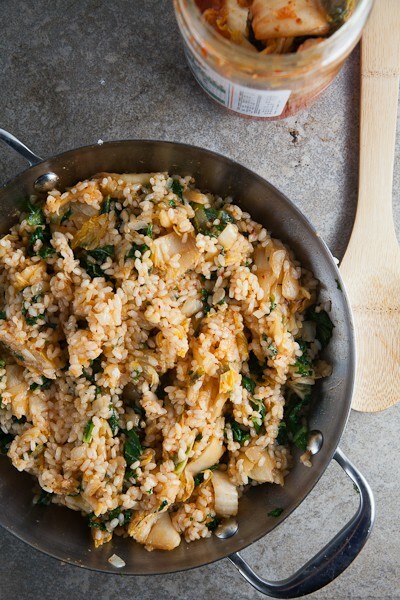 Kimchi + Kale Fried Rice | Healthy. Delicious. Two Saturdays ago (already?!) Shawn and I took an impromptu day trip to New York City. We live just close enough that we can do that, provided we plan it the night before and set the alarm nice and early. We had a great day, hitting up Les Halles for lunch (I had the merguez and Shawn had the flat iron; I highly recommend both) before checking out an exhibit at the library, wandering through The Frick Collection (love the architecture! ), visiting the polar bear and penguins at the Central Park Zoo, and doing some shopping. By the time the sun started to go down, we were starving! We wanted something different for dinner and turned to the internet for advice. Anyway, I would eat there every night if I could. I have no idea why the place wasn’t packed (except for the weird location, which isn’t exactly busy on a Saturday night). We left the restaurant totally stuffed, and yet somehow still craving more Korean food. Of course, that meant I needed to put something Korean-inspired on the week’s menu! 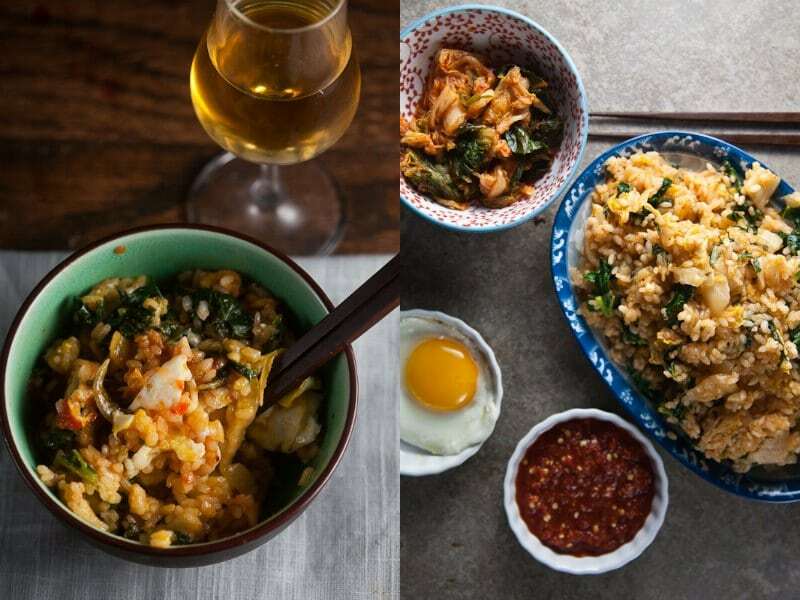 This Kimchi fried rice is comfort food at it’s best. 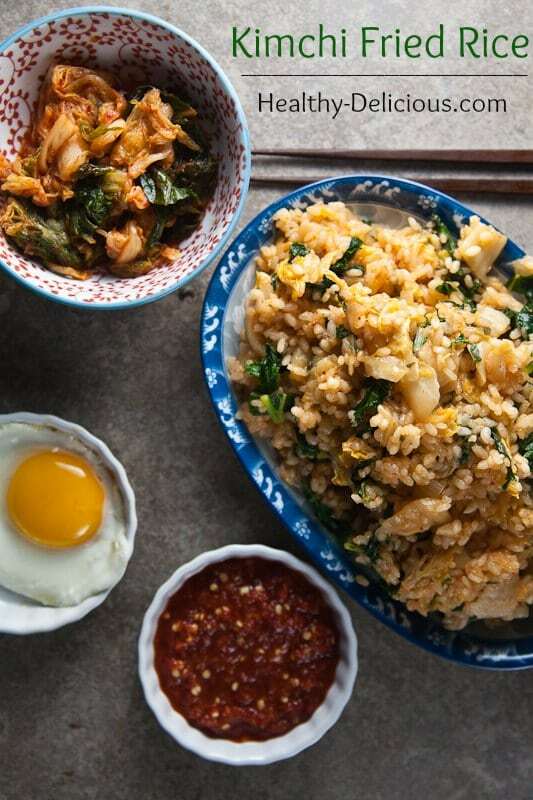 It’s the perfect combination of starchy rice, spicy chili paste, and sour kimchi. 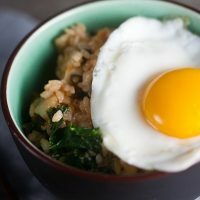 Throw in a little kale for good measure and top it off with a runny, sunny-side up egg – what more can you ask for? 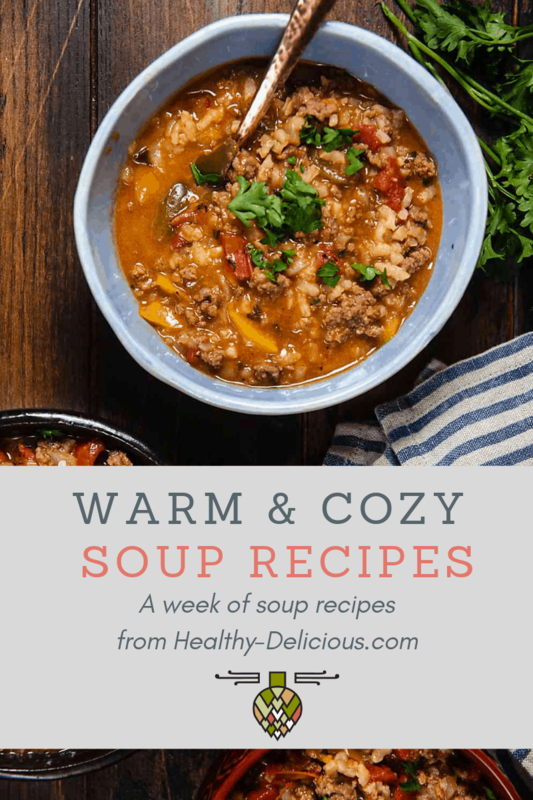 If you think ahead and cook your rice the night before (or make extra to go along with another meal earlier in the week), this meals comes together in no time. 15-20 minutes, tops. It’s also pretty hard to mess up… fried rice tends to be pretty forgiving! I like mine extra spicy and with tons of kimchi – a 1:1 ratio with the rice – but you can tweak it to our own liking. For the best results, cook the rice the day before and refrigerate it overnight – this will allow the starches to harden and will prevent the fried rice from being gummy. Keep some precooked rice in your freezer and you'll always be ready to go, just defrost it before cooking. Heat the sesame oil in a large skillet set over medium heat. Carefully crack in the eggs; cook 2 minutes. Cover and cook an additional 1-2 minutes or until the yolks are cooked to your liking. 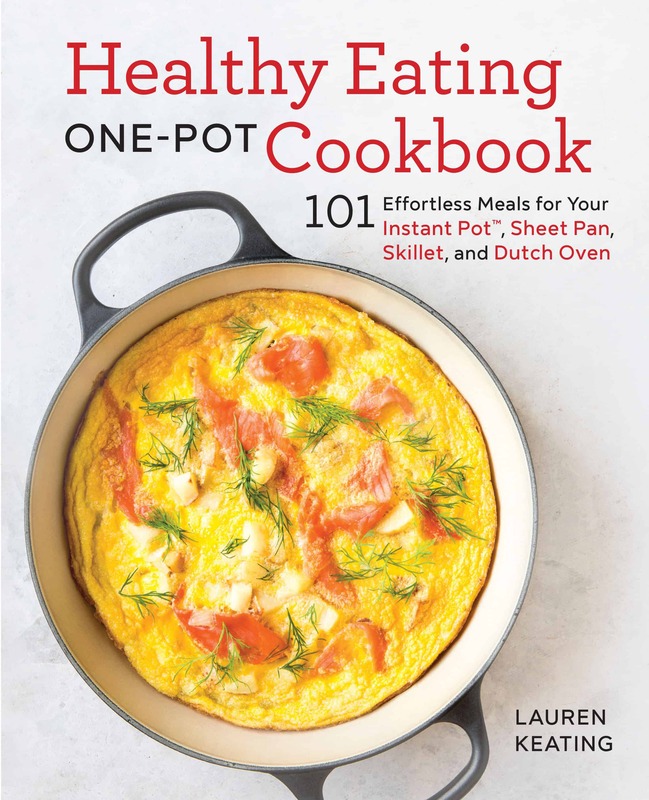 Transfer the eggs to a plate and return the pan to the burner. Add the onion and garlic; cook, stirring occasionally, until the onion just begins to soften – about 5 minutes. Increase the heat to high and add the rice and kimchi; cook, stirring constantly until the rice is heated through – 3-5 minutes. Stir in the kimchi liquid, soy sauce, and kale. Cook 1-2 minutes, or until the kale has wilted. 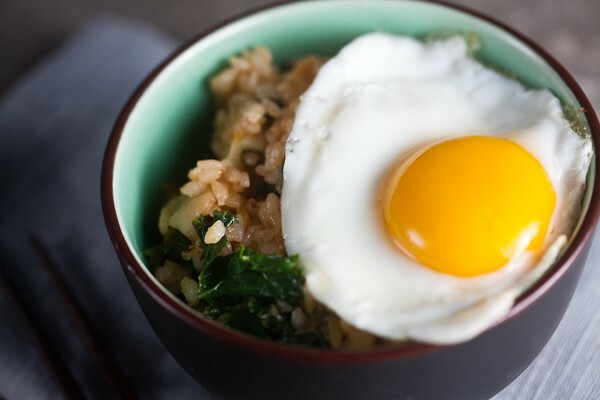 To serve, top each portion of fried rice with an egg. Allow each diner to add their own chili sauce to taste. My dad loves kimchi!!! I think he would love this! Korean restaurants aren’t known for their savvy names. lol! Yay kimchi! I just finished a 10lb jar…and now I need another. This looks wonderful. My spouse was stationed in Korea and developed a taste for many Korean foods which he has shared with us. I’m keeping this in mind for when our CSA farm share starts back up in 8 weeks. And 4 days. Not that I’m counting or anything. Okay…so I need to go to this place. ASAP. Like, yesterday. I’m dragging the boy next week. Also…I go crazy for kimchi. This fried rice sounds AWESOME. I loved Angelo on Top Chef. he did a lot of Korean inspired dishes. YUM! Think you could mail me some of that fried rice? Kthanksbye.